China is a country where the agricultural areas are frequently affected by natural hazards, and comprehending the change trends of natural hazards is of great significance to sustainable development in agriculture. Innovative trend analysis (ITA) is a new and important trend detection method. In this study, the ITA method was used to analyze five kinds of natural hazards in agricultural areas of China during 1989–2014: wind and hail, forest fire, drought, flood, and freezing hazard. The ITA method was compared with two traditional trend analysis methods, i.e., the Mann–Kendall (M–K) test and linear regression analysis (LRA). The results showed that the areas affected by wind and hail, forest fire, drought, and flood in China are showing significant decreasing trends (p < 0.01 or p < 0.05), whereas the areas affected by freezing hazard are showing significant increasing trends. Using the LRA and M–K test methods, 40 and 51 time series with significant trends (p < 0.01 or p < 0.05) were detected, respectively, while ITA was able to successfully detect 138 significant trends (p < 0.01 or p < 0.05), including 89 time series that did not show significant trends when using the LRA or M–K tests. The time series surveyed indicated that the ITA method is superior to the two traditional analysis methods, and it is able to detect the hidden trends in time series. In addition, based on the analysis of the spatial distribution of the ITA data, the areas affected by wind and hail, forest fire, drought, and flood are showing significant decreasing trends in Southwest and East China (p < 0.01 or p < 0.05), whereas in the North China and part of Central China, there are significant increasing trends for these four natural hazards (p < 0.01 or p < 0.05). In most part of North, Central (p < 0.01 or p < 0.05), Northwest (p < 0.01 or p < 0.05), and South (p < 0.01) China, freezing hazard is increasing significantly, and it is showing a significant decreasing trend only in East and Northeast China (p < 0.01). This research was financially supported by the National Natural Science Foundation of China (Grant No. 41571400) and the National Key Research and Development Program of China (Grant No. 2018YFD0300905). The paper was also supported by the Open Research Fund Program of Anhui Province Key Lab of Farmland Ecological Conservation and Pollution Prevention, and in part by the Anhui Key Laboratory of Smart City and Geographical Condition Monitoring under Grant 2016-K-01Z. The authors would also like to thank the reviewers for their constructive suggestions and comments. 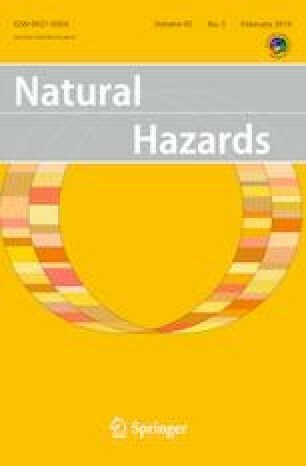 JL and WW conceived and designed the methodology of innovative trend analysis of the main natural hazards in agricultural areas. XY advised on the methods applied in the study, HJ, RG, HW, JH, and YJ performed the experimental analyses. All authors read and approved the final manuscript.